I hope everyone is having a great week! Mine has been hectic and busy. I'm falling behind in responding to e-mails, reading all the blogs I so love to read, and I'm just plain tired. I have also been working on some special things for some special someone's.... more on that another time. 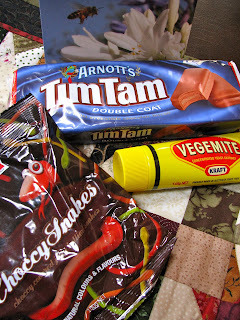 Some wonderful Australian candy and cookies. Didn't last long. Tim Tam's are great! I did a search online and you can get them at Target for a limited time only. So go stock up! I have to say, I have heard of Vegemite, but I am not sure what to do with it, any suggestions would be so helpful. 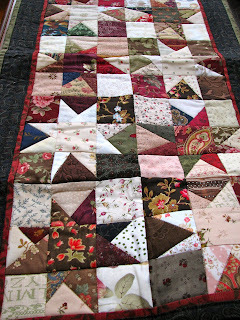 Then the creme de la creme.... this wonderful table runner was made by Peg. Absolutely impeccable workmanship! I just love it!! Thanks so much, Peg! Here you can see it gracing the chair side table in my bedroom. It is just the perfect place. That is my Mom with me in the picture. What a bright spot in a busy week! Now I would like to offer a bright spot to all of you. Click HERE to see a wonderful slideshow packed with some beautiful inspiration for your creative minds. Turn on your volume and enjoy! !